Matthew Beall started his real estate sales career in Hawai‘i in 1998. He has several years of non-profit experience, largely through Realtor organizations. He’s served as the President of the Kaua‘i Board of Realtors and as a Director-at-Large and Executive Director of the Hawai‘i Association of Realtors. Matthew runs a lucrative company, Hawai‘i Life Real Estate Brokers, with 170 employees. Dr. Jonathan Likeke Scheuer works as a consultant helping clients manage environmental conflicts involving cultural, economic, and conservation stakeholders. Born and raised on O`ahu, he holds a B.A. and Ph.D. in Environmental Studies from the University of California, Santa Cruz, and a M.E.S. from Yale University, School of Forestry and Environmental Studies. He has worked on land conservation, real estate, and water management for the Office of Hawaiian Affairs, Kamehameha Schools, the National Park Service, and others. In addition to serving on HILT’s board since its founding, he currently serves as an a member of the Hawai`i State Land Use Commission. He has previously served on the boards Mālama Mānoa and the O`ahu Land Trust and as a Kona Moku representative and the Vice Chair of the O`ahu Island Burial Council. President of 3-K Financial Corp. Former Chief Financial Officer and Treasurer of National Education Corporation (Irvine, CA), a global leader in proprietary education, corporate training and publishing (part of the S&P 500 index). Acquired in 1998. SCORE Association volunteer (a national volunteer organization that mentors and advises small businesses and resource partner of the SBA), member of Board of Directors, Executive Committee, Leadership Committee, Finance Committee and Secretary. Board member of several not-for-profit entities and for-profit, post-secondary education entities in the U.S. and Asia. Sarah was born and raised on the island of Kauai. After high school in L.A. and college in Denver, Sarah joined her father in the family real estate business in St. Louis, MO. She successful ran the company from 1985 to 2008, then merging it with another firm to create the largest, independent residential real estate company in St. Louis. She also became engaged in numerous philanthropic endeavors over the years, including serving on various for profit, and not for profit boards. Her love of nature and conservation brought her back to Kauai full-time, and to offer her services on the board of HILT. Mary Charles is a 45-year resident of Hawaii with involvement in both the business community and the philanthropic community. Mary Charles pioneered the corporate incentive and group market in Hawaii's tourism arena and built one of the leading and most well respected destination management companies in the islands. After selling MC&A, she pursued business interests on Lanai, including the ownership of Hotel Lanai and Lanai City Grille, which she recently sold. Mary Charles continues to do projects using her event planning and logistics background and recently provided the logistics and production for the Pillars of Peace programs on behalf of Hawaii Community Foundation and The Omidyar Group. Yoga practitioner, avid golfer and loves to hike. Le‘ahi Hall was born and raised in Hamakualoa, Maui. Growing up, malama ‘aina was more than just a concept. From a young age she attended countless meetings to protect water rights, open beach access, and preserve cultural sites. Le‘ahi is a member of the first graduating class of Punana Leo o Maui, and one of two students who continued Hawaiian language immersion education through high school in the lead class of Kula Kaiapuni o Maui. Being raised in a rich cultural environment contributed to her earning a degree in Cultural and Social Anthropology from Stanford University. Le‘ahi was also a member of the Stanford women’s volleyball team, during which time Stanford won two NCAA championships. Le‘ahi has worked in admissions as an outreach coordinator, is on the board of Hui Alanui o Makena, is a First Nations’ Futures Fellow, and has coached youth volleyball teams to numerous top 10 National finishes, including a State Championship and a #1 National Ranking. In 2016, Neil Hannahs concluded over 41 years of service to the Kamehameha Schools and launched Hoʻokele Strategies LLC, a consulting enterprise serving as an intermediary in developing and connecting inspiring social entrepreneurs with exceptional mentors and aligned impact investment capital. From 2000 to 2015, he directed the Land Assets Division of Kamehameha Schools and was responsible for a portfolio of 358,000 acres of agriculture and conservation lands in Hawai`I and also founded the First Nations Futures Program and Hawaiʻi Investment Ready Program. The work of this division earned the Innovation Award of the Hawaiʻi Conservation Alliance, as well as the Kamaʻāina of the Year Award from the Historic Hawaiʻi Foundation. Mr. Hannahs is a graduate of Kamehameha Schools and received BA and MA degrees from Stanford University. He is active in community affairs and effective July 1, 2016, he will begin a four-year term on the State of Hawaiʻi Commission on Water Resources Management. Born and raised in Honolulu, Hawaii, Mark Hastert attended Dartmouth College (B. A.) and the University of Washington (B. Arch. & M. U. P.). In 1980, after working for 10 years as Senior Planner for Belt Collins, he co-founded Helber Hastert & Fee, Planners, Inc. and served as President and Chairman, working on numerous planning projects throughout Hawaii and the Pacific Basin. In 2003, Mr. Hastert retired from HHF to head The Queen Emma Foundation, where he was responsible for overseeing the management of its 12,000 acres and leading its strategic planning initiatives. In 2008, Mr. Hastert became a Fellow in the American Institute of Certified Planners (FAICP), one of only 8 in Hawaii who have received the honor. In 2011, Mr. Hastert joined the Board of Directors of the Hawaiian Islands Land Trust and currently heads the Strategic Planning Committee. Susan began her art career at an early age at the Art Students League in New York City and continued at Pratt University in Brooklyn. After receiving her BFA she opened Fine Art Tile, a business specializing in custom hand-painted ceramic tile. In her 30 years of operating this business, 20 in Hawaii, she completed many commissions for a multitude of restaurants, hotels and private homes. She recently took up oil painting en plein air which has helped strengthen her conviction of preserving iconic landscapes and open space. An avid hiker, paddler, biker she is passionate about nature and is happy to be affiliated with an organization that works so hard to preserve land. Susan sat five years as a founding advisory director for BookTrustMaui. She started serving on the board of Maui Coastal Land Trust in 2008. She is currently serving as chair of the governance committee for the Hawaiian Islands Land Trust. She is married to Jac Kean and they happily share four wonderful children. Jennifer Luck is the Managing Director for the Porter Trust, overseeing land assets, charitable giving and estate planning for the Trust. Born and raised in Los Angeles, she graduated from the University of Oregon and previously worked for the United Farm-workers Union, Peace Over Violence and as Executive Director of the Institute of Real Estate Management. Jennifer and her husband Jason moved to Kaua`i in 2007 when Jennifer was offered a position as the Executive Director of the Kaua`i Public Land Trust. From 2011 – 2015 she served as the Kaua`i Island Director of the Hawaiian Islands Land Trust. She currently serves as Vice-Chair of the Board of Kaua`i Planning and Action Alliance and in 2014 was elected to the Princeville at Hanalei Community Association Board of Directors. She resides on Kaua`I’s north shore with her husband Jason and daughters Midge and Frankie. Jennifer is honored to join the Hawaiian Islands Land Trust Board of Directors, she looks forward to continuing her conservation work and supporting the mission of this fantastic organization. Kepā Maly was raised on the islands of O‘ahu and Lāna‘i. While growing up on Lāna‘i, kūpuna immersed Kepā in Hawaiian cultural practices, language and values. Kepā’s career has focused in the field of cultural and natural resources, ethnography and the recording of Hawaiian history from Ni‘ihau through Hawai‘i and beyond. Since February 2013, Kepā has been responsible for overseeing activities related to archaeological-cultural surveys, preservation planning of cultural resources, and encouraging the perpetuation and preservation of Lāna‘i’s traditions and historical heritage, as a member of the executive team of Pūlama Lāna‘i. He works to ensure the history and culture of Lāna‘i are passed down by sharing the history of Lāna‘i with residents, visitors, and staff members. Prior to joining Pūlama Lāna‘i, Kepā was the Director of the Lāna‘i Culture and Heritage Center (www.lanaichc.org), and he continues to lead that organization through the present day. In 1994 Kepā his wife, Kamakaonaona Pomroy-Maly, started Kumu Pono associates, a Hawaiian ethnographic research firm, and together they have conducted hundreds of oral history interview, authored many cultural studies, and developed interpretive educational programs across the state. Kepā has also served on many cultural heritage and natural resource management boards across the state (in community, county, state, and federal programs); he has also worked for the National Park Service, University of Hawai‘i, served as the curator/exhibit designer for the Kaua‘i Museum, and is the Executive Director of the Hoakalei Cultural Foundation (www.hoakaleifoundation.org). He has also received several awards and sat on various boards over the years. Peter Merriman has been a culinary pioneer in Hawaii for over 25 years. Known as the original “locavore”, Peter is a vocal champion of Hawaii’s farmers, ranchers and fishermen. His restaurants showcase island grown and harvested foods through simple preparations that reflect the myriad flavors of Hawaii’s multiculturalism. Dubbed the “Pied Piper of Hawaii Regional Cuisine” by The Los Angeles Times, he is a continuing inspiration to Hawaii’s thriving culinary scene. All of Peter Merriman’s restaurants share a common mission statement: “Do the Right Thing!” Every member of the staff is taught to respect the `aina (land) that feeds and the people who produce the food, to be proud in their work, and to take responsibility for making sure every customer has a memorable dining experience. 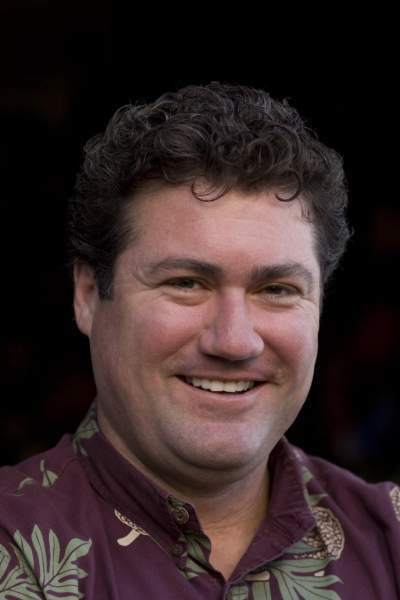 Rob Pacheco is the Founder and President of Hawaii Forest & Trail and Kohala Zipline. As an Interpretive Naturalist, Rob has spent three decades sharing his passion for nature with people of all ages and walks of life. Since 1993 Hawaii Forest & Trail has connected nearly half a million visitors and residents with Hawaii’s world renown nature and natural history. Rob has extensive leadership experience with Hawaii’s conservation challenges, land use issues and tourism industry. He served two terms as the Hawaii Island member of the State Board of Land and Natural Resources. He is currently on the board of the Big Island Visitors Bureau and, starting in 2016, will serve as its Vice-Chairperson. He holds lifetime memberships in the National Speleological Society, American Birding Association, and the National Association for Interpretation. He lives in Holualoa with his wife and business partner Cindy Pacheco. McD is a Native Hawaiian artist and woodworker, whose life and work is strongly influenced by the wisdom and sustainable practices of his Hawaiian ancestors. He designs and produces carved furniture, art panels, along with the occasional canoes, sculptures, and calabashes. His company, Hawaiian Furniture Co., runs its own sawmill operation and many of their products are primarily made from salvaged urban and non-native timber. The business is an industry model for environmentally responsible practices. McD was an honoree at the 2009 Hawaiian Civic Club of Honolulu’s Holoku Ball, where he was recognized for his art and efforts toward long-term sustainability to preserve Hawai’i for future generations. He currently sits on the Board of Directors of Hawaiian Islands Land Trust, Asset Schools, Edmund C. Olson Trust II and The Friends of Honouliuli . He enjoys his work, surfing, and teaching conservation and sustainability. David was born and raised in St. Louis, Missouri and received a bachelor’s degree in finance from Washington University and a masters in Conservation Biology from the University of Missouri – St. Louis. He has been on the board of the Nature Conservancy Missouri Chapter and have done work for Conservation International. David is currently on the Board of the Hawaiian Islands Land Trust and an Ambassador for Windward Community College. He has been a financial advisor for 31 years and currently run the Ameriprise Financial office in Kailua. David has a wonderful family including three daughters and Kimberly Moore, and has paddled for Lanikai for 11 years. Larry moved to Maui in 2008 after 30 years in the software industry as a product design and management executive. He graduated in Economics from the University of Kansas and served in the VISTA program. He serves as a board member of the Maui Nui Marine Resource Council and is a member of the Planning Committee of the Kihei Community Association. Bill Swank graduated from Pomona College and Stanford Law School. In 2009, Bill and his wife Lynn purchased a home on Hawaii and recently moved here. Bill grew up in Arizona, Kenya, and Europe where his father was a wildlife biologist. Prior to moving to Hawaii, Bill served on the Board of the Palos Verdes Peninsula Land Conservancy. As chair of its acquisition committee, he was deeply involved in acquiring more than 1600 acres of open space either through conservation easements or land purchases. Gunars Valkirs was born in San Diego, CA, and educated at the University of California in San Diego where received a BA in 1974 and a Ph.D. in Physics in 1982. Gunars went to work for Hybritech Incorporated, one of the first biotechnology companies and invented the first fast and sensitive pregnancy test there. In 1988, Gunars co-founded Biosite Incorporated, a company focused on developing novel medical diagnostic tests. Gunars was responsible for R&D and later for Research while the company grew to 1200 employees and more than $300 million in annual sales. In 2007 Biosite was sold for $1.7 billion and Gunars retired to Maui where he lives with this wife JoRene and their three dogs. Gunars has recently come out of retirement to start a cacao farm and make great chocolate.